Happy Monday! It's been a lovely weekend here. Such beautiful weather that we had to break out the air conditioner. Lots of family time. And a hot air balloon festival in a nearby town that we went to twice - pictures to come on Saturday (hopefully)! How was your weekend? I never got a chance in April to share my thoughts about On the Banks of Plum Creek, which was the April read for the Little House Read-Along. So I thought I would write up my thoughts for both books this month. This is my first experience reading the Little House series. In each one of these books, it always amazes me how simple yet complicated life is for the Ingalls family. Simple because they don't have many of the issues that face us in the 21st century. Complicated because you couldn't just run to the grocery store if you forgot an ingredient. Now that they're settled in South Dakota in a growing town it will surely be easier, but it's still hard to imagine living that life. All of the books in the series are basically the same. They tell the story of a year in a new place and everything they needed to do to survive. Sure, there are variations based on what new place they are living in, but the basics don't change. That's probably part of what makes this series so beloved, especially for those who read it as children. You can escape to life on the prairie over and over. As Laura gets older, she's showing a lot more personality, which is fun to see. She's a tomboy, always ready to head outside and explore. It's nice to get to know her. Why don't they talk about anything sad? In between these two books, Mary went blind and, according to the family tree in the front, they had a little brother that was born and died - yet is never mentioned. I'm guessing skipping over the details of these events (or the event entirely) was a conscious decision Laura Ingalls Wilder made as she was writing. Perhaps she thought people read these books for their feel-good nature, not for reality. I guess I'd rather know the truth of what happened to their family, but maybe that's just because I'm reading the books as an adult. 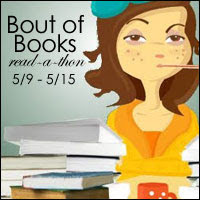 So much bookish fun this past week in the blogging world - Bout of Books, BEA, and Armchair BEA. If only I could have participated in it all (one of these years, I will get to BEA!). I chose to participate in Bout of Books because readathons are awesome. Between audiobooks and making reading a priority during my downtime, I read a lot more this week than I expected to! You can check out my update post here. Three books at a time! That never happens to me! Overall, I read a lot more than I expected, mostly thanks to audiobooks. I was surprised by how much listening time I got in, and I didn't even listen more than I would on a normal week. Hooray for multi-tasking while reading! Yay, it's Monday and I'm reading - and posting about it! It feels so good to be blogging again. Hopefully the little guy continues to give me some time to do so! It's Bout of Books this week! So here is my stack, along with a few audiobooks. Of course, I will probably only get to a small fraction of this, but something is better than nothing! Read-a-thons are one of my absolute favorite things about the book blogging world. Which is why I participated in Dewey's 24-Hour Read-a-thon, even though I had a tiny baby to take care of. That actually went better than I expected. So a week-long read-a-thon should be no problem. Bring on the multi-taskable audiobooks! Things have been pretty quiet here on Smiling Shelves recently. That's because we had a new arrival at our house last month! Life has been pretty unpredictable (hence the lack of posts here), but it's starting to settle down into a routine-like thing. Smiling Shelves will soon be up and running again, though I don't think my previous 4 posts a week will be possible. But I'm still reading (and reading to my little guy), so I'm sure there will be plenty to post about. Thanks for sticking with me on Smiling Shelves as I discover this whole new reason to smile!